Study English in Oxford and exploring the variety of England – this is possible during your time at EC Oxford – an example for that is the visit of the Warner Bros. Studio Tour in London! “The Burrow”, “Aragog” or “Diagon Alley”: Are these expressions familiar to you? Then the Warner Bros. Studio Tour London in Watford is an absolute must for you. All this and a lot more can be discovered at the tour through “The Making of Harry Potter”. This blog shall give you a small insight about the tour even though there is so much more to discover than described. When you arrive, the Warner Bros. Studio doesn’t look very big and impressive from the outside. 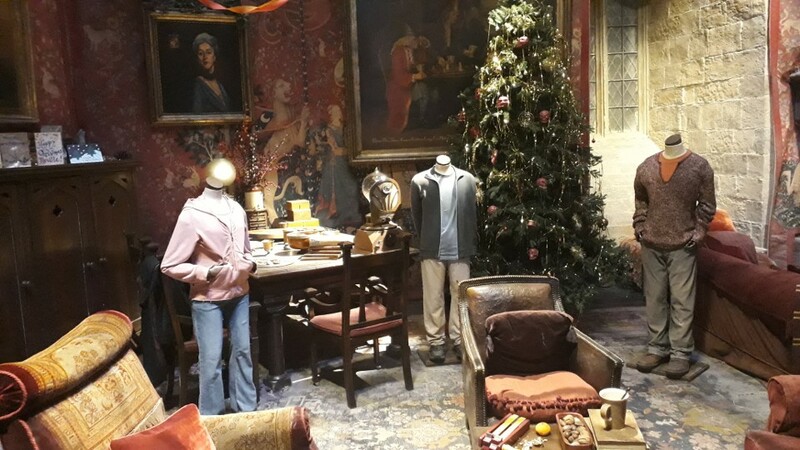 But between the entrance and the exit of the Studio you will have a lot of pleasure and you will be fascinated by the World of Harry Potter – I and many of our students can confirm that, we already had this wonderful experience. Directly behind the entrance you have to pass a large corridor and on the walls to the right and to the left you can read lots of quotes you know from the Harry Potter films. After the corridor there’s a Studio Shop, where you can buy some hot food, butter beer or just a hot coffee, so that you will be well prepared for the breath-taking tour through the World of Harry Potter and the secrets about how they made it. 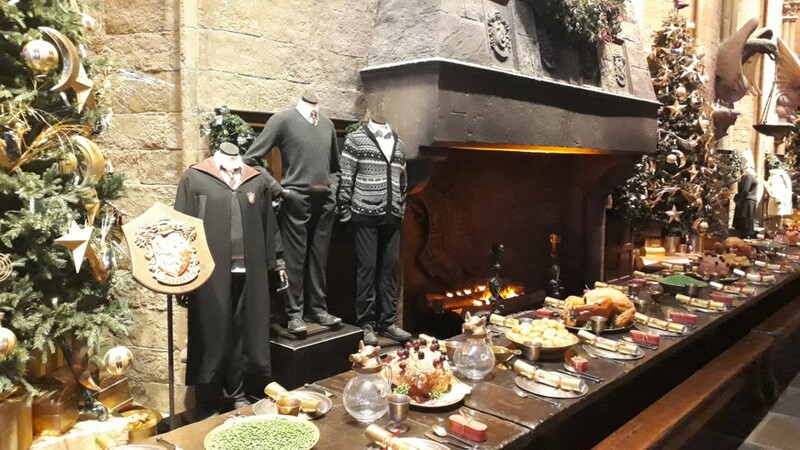 The tour begins with one of the most famous locations of Harry Potter – the very large Dining hall which is inspired by the hall at Christ Church in Oxford. Here you can see food and drinks on the tables. Because of Christmas Time Christmas crackers were lying on the plates. At the tour you can also see the well-known Gryffindor common room. It is much smaller than expected. When they filmed the scenes, the whole crew was in this small room and it was not very easy to film the scenes because of the small space. This room is also used as the common room for the other houses. In “Harry Potter And The Chamber Of Secrets” this room is also used as the common room of Slytherin. They changed nothing except the house-colours. Besides famous and important rooms and buildings, you can make the unique experience to step into Harry Potters footsteps: Ride on a broom through the streets of London and catch a fish from the Great Lake at Hogwarts. Photos of this fantastic journey through London and Hogwarts will remind you every time, how exciting this day was for you. The next stop after the walk through the spooky forbidden forest, where you see Hagrid’s friend Aragog and his ‘little’ daughters and sons is King’s Cross. At the world’s most famous train station you can walk through the wall at platform 9 ¾ and have a look into the cabin of the train, where Harry and his friends made their first experience with dementors. The tour also includes the house of the Dursleys at 4 Privet Drive where you can go through the house of the Dursleys and see the many envelopes which include the invitation for Harry to go to the Hogwarts School of Witchcraft and Wizardry. Dobby, Goblin, Buckbeak and many more fantastic creatures: Discover how complex the work and how huge the creativity of the whole crew was to bring them to live. 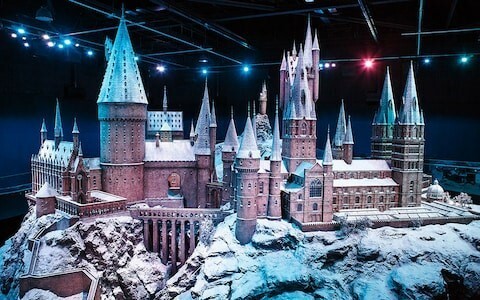 At the end of the tour, after you walk through the Diagon Alley and look into Ollivander’s and into Weasleys Wizard and Wheezes of Fred and George, you will be impressed of the Hogwarts Castle Model. When I stepped into the almost dark room and saw this amazing, large Hogwarts Castle Model, I was really impressed. It is astonishing how many details you can see. This model had been changed after every published Harry Potter book because the wanted to include all the details which are mentioned in the books. Therefore, they reworked this model and they included more and more details as each new book was released. The result is just impressive, and a must see. In Winter the Hogwarts Castle is snow-covered which makes the atmosphere very peaceful. Before you leave the World of Harry Potter and start your journey home, you can buy a souvenir for yourself or gifts for your friends and family in the large gift shop. Furthermore, there is also an opportunity to strengthen yourself with a meal and a nice hot drink. Summing up I have to say that I can highly recommend a visit at the Warner Bros. Studio in London! It is totally worth the while! A lot of our students at EC Oxford also visited this interesting spot and I only heard positive reviews! It was a wonderful experience for me and everyone else! Not only can you experience a lot, you also get the opportunity to take some great and special pictures! So, come along and dive into the world of the famous Harry Potter for a day! Let the magic bewitch you!